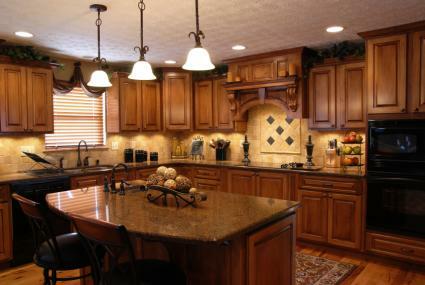 Kitchen remodels can completely transform the look and feel of your kitchen. They can also be a very costly endeavor with many kitchen remodels costing upwards of $30,000. They don't have to cost this much, however; by using your resources wisely and following a few budget friendly tips, you'll have a new kitchen without the new kitchen price tag. Most homeowners that start out wondering how to remodel their kitchen on a budget don't actually have a number in mind. They just know that a big ticket remodel isn't in the cards, but they need to do something to the kitchen they have. Begin by setting a realistic budget for yourself. Even a $500 budget can go a long way toward making your kitchen closer to the one in your dreams. The best way to get the biggest bang for your buck in a kitchen remodel is to pick one item that you love and have to have. This can be a granite counter, a glass backsplash or new cabinets. The key is to allocate your money toward that one item first; you can fill in the rest of the remodel with budget tricks afterward. Having that one item will go a long way toward making you happy with the end results. Every piece of your kitchen can be remodeled at several different price points. Assuming you aren't going custom everything, follow some of these tips to get the kitchen of your dreams. New cabinets are usually the most expensive part of the kitchen design. Normally when you replace the cabinets, you also change the layout of the kitchen to make it more efficient, and this adds up in cost. 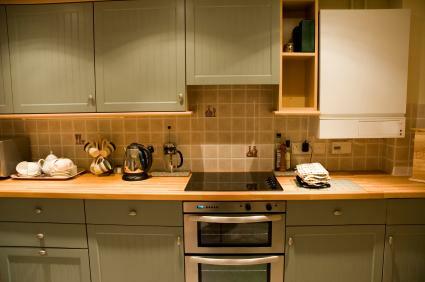 Shop for budget cabinets at places like Ikea, Lowes or Kitchen Resource Direct. Any of these companies can get you new cabinets for around $2000. Reface your cabinets. Cabinet refacing replaces the doors of your cabinets, but leaves the frame intact. It can cost as little as $500. Paint your cabinets. With a little sanding and the right paint you can give your kitchen a new look for the cost of the paint and brushes. Purchase an American granite. Stones quarried in the US are much less expensive than those shipped from overseas. They may cost as little as $19 a square foot installed. Ask your local stone yard for stones quarried nearby. Paint your counters. New paints are available that can transform your existing counters into a work of art that resembles granite or marble. The paint costs around $50 and lasts for years. 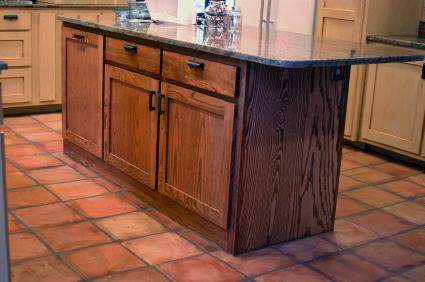 Your kitchen floor gets a lot of traffic, and can really date the kitchen, particularly if it's old vinyl or linoleum. Even if you have older wood floors, there are ways you can transform your current floor into something special. Purchase slate tiles. Slate is beautiful, exotic, easy to care for and costs around $1 a square foot at most home centers. It has a lot of natural variation, which makes it work in nearly every space. Purchase Saltillo tiles. They also cost only $1 to $2 a foot and gives a warm, exotic look to the space. Paint your hardwood or existing ceramic floors. Give your hardwood a faux checkerboard look, or paint your existing ceramic tiles a more updated color using urethane paints and a urethane sealer. A word on your flooring in older homes: if you have old vinyl or linoleum installed before the 1980s, you can assume it contains asbestos. If it is well adhered to the subfloor, try installing a floating floor right over it. You can cover it up without the extreme expense of having it removed. Poor lighting can make any kitchen appear outdated and poorly done. 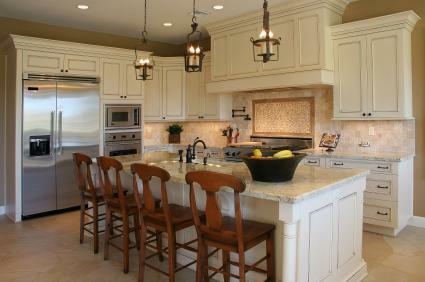 Updating the lighting in your kitchen can make the entire space seem lighter, brighter and larger than it was before. Recessed lights are one of the least expensive ways you can quickly brighten up your kitchen, provided you have access to the kitchen from above. Install it as a border or accent with a field of less expensive tiles. Field tile at your local Home Depot will run you less than $1 a foot, and it can be used with more expensive accents. Confine it to a decorative area behind the stove. Frame this area out with a chair rail, and use a less expensive tile along the counters. This will also create a focal point in the room. Install a crown molding at the ceiling. This adds instant style to the space, and if installed on the ceiling itself, rather than the wall, it can have the added benefit of making a shorter ceiling appear much taller. Create a kitchen chalkboard. Chalkboard paint is fairly inexpensive and can make a great accent in any kitchen. Frame out the "chalkboard" with some tiles that match the backsplash for a custom look. Add an accent wall. Paint one wall of the kitchen a bold color to draw the eye and add some pop to the design. Use appliance paint. Give your appliances a new look with a coat of appliance paint. You can quickly transform old white or black appliances to a stainless steel finish for less than $50. Replace the refrigerator first. Unless your appliances are broken, replace the refrigerator first, then replace the others one at a time as your budget allows. All the appliances should match the fridge in the end. Remember that buying budget appliances may not be the best thing for your pocketbook; they can need replacing in just a few years. Instead, check for appliances at discount stores such as Direct Buy or Sam's Club to get the best appliances for your money. Is the sink the same gauge everywhere, including the seams? Does the sink have a sound deadener on the bottom to eliminate echo? Does the faucet have a ceramic disc cartridge? Is the faucet solid metal, or does it have a plastic finish or coating? A good faucet and sink, no matter how inexpensive, will have a lifetime warranty. While you can find these items for as low as $100, don't purchase anything that can't be backed up or replaced in a few years if you need it. Cabinet hardware. Swap out all your cabinet hardware for a mini-facelift to your cabinets. Cabinet crown molding. Remove your old soffit and install some crown molding on top of your cabinets instead. It will look more up-to-date and modern this way. Outlet covers. Replace the outlet covers in the backsplash area with decorative covers that match the tile. Glass cabinet doors. It's actually fairly easy to remove the center panel from your existing doors and to install a piece of glass using mirror mounting hardware instead. Get the glass from a shower door company for cheap. Remember to be upfront with everyone you meet on your kitchen remodel journey. Don't be afraid to go into seemingly high-end tile stores or stone yards. Just explain your budget and ask for help finding items that can work for you. Most professionals will have a few tricks up their sleeves for helping make your budget kitchen dreams a reality.